That estimate—about 40 percent of the mass of Saturn's moon Mimas, which itself is 2,000 times smaller than Earth's moon—tells them that the rings are relatively recent, having originated less than 100 million years ago and perhaps as recently as 10 million years ago. 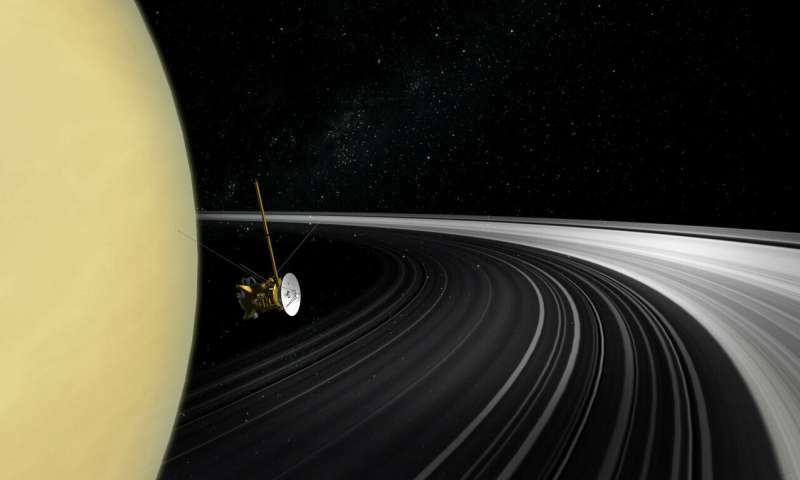 The new mass estimate is based on a measurement of how much the flight path of Cassini was deflected by the gravity of the rings when the spacecraft flew between the planet and the rings on its final set of orbits in September 2017. Initially, however, the deflection did not match predictions based on models of the planet and rings. Only when the team accounted for very deep flowing winds in atmosphere on Saturn—something impossible to observe from space—did the measurements make sense, allowing them to calculate the mass of the rings. 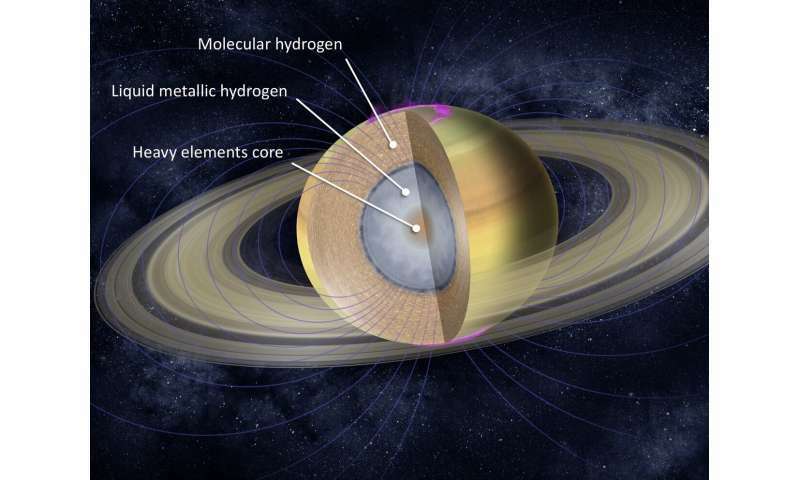 Earlier estimates of the mass of Saturn's rings—between one-half and one-third the mass of Mimas—came from studying the density waves that travel around the rocky, icy rings. These waves are caused by the planet's 62 satellites, including Mimas, which creates the so-called Cassini division between the two largest rings, A and B. Mimas is smooth and round, 246 kilometers in diameter. It has a big impact crater that makes it resemble the Death Star from the Star Wars movies. This article and possibly the original report by the scientists seems to be skirting the real issue here: HOW did the rings form around an already existing planet? So now that we know ( as creationists have long predicted ) that the rings are YOUNG ( though secularists will insist on millions of years...sigh) it creates a very, very tough (if not impossible) nut to crack for the big bangers in their having to explain how those rings formed billions of years after the planet was formed. Their main problem is now finding a non-existent source or sources and then delicately positioning it in the orbit of the already spinning and orbiting planet in such a way that it can deform into multiple layers of concentric rings.Including different rates of decay.! I am waiting with bated breath for the miraculous events that will per force have to be conjured up from nothing. No evidence will suddenly turn into solid, unassailable fact. All from nothing. Just like the big bang itself. ohh freddy, you didn't just step in it. You dove headfirst into the yec cesspool. yech! Two words for you, "Roche Limit". Why you primitive sanguinary anthropophagous savages infest a science site is not really such a mystery. freddy & his gaggle of the credulous taliban are masochists. Who get off masturbating to being humiliated with every stupid comment they post.